1. the head of FEMA has agreed to expedite the production and installation of the phone cable. 2. The sprinkler program with FEMA will be repeated. FEMA will pay 75% with a 25% participant match for new system installations, existing system upgrades, or repairs to damaged systems. 3. The Director of FEMA (feeling a 800 Mhz system would not be appropriate for this area) will be contacting the Sheriffs office and the Gunflint Trail Volunteer Fire Department to get an appropriate communication system for the Gunflint Trail. 4. The Director of FEMA and Congressman Oberstar have both looked at the application by the Gunflint Trail Volunteer Fire Department for the pumper truck. FEMA will contact the GTVFD directly to help write an application that will be approved. 5. The Small Business Administration plans to see what they could do to help businesses. Two regional SBA representatives will visit Grand Marais to assist people impacted by the fire to get loans directly from the SBA. They have asked the Governor to fax the necessary letter to the SBA where it will be immediately approved. Once approved the SBA people can start issuing loans. 6. Finally, FEMA has really nice trailers available for temporary use while rebuilding. The trailers are currently in another state. The Congressman needs to know how many trailers people will need to use while they rebuild. Congressman Oberstar says they are "nice trailers". Watch the http://www.gunflint911.org website to sign up to receive information regarding FEMA assistance for Wildfire Sprinkler Systems. A sign-up form should be available at that site within the next day or so.Our heartfelt thanks to Congressman Oberstar, for his prompt attention and response to our needs. Saturday Memorial Day Weekend was a beautiful day - over one hundred people assembled at Blankenburgs Landing on Seagull Lake to assist home owners and businesses from the Seagull- Sag area to begin to replace their trees lost in the recent Ham Lake Fire. The next day, Sunday, it rained most of the day yet another sixty plus people showed up to continue planting. By the time the two planting sessions were completed over six-thousand red and white pine, cedar and white spruce seedlings were in the ground. Joining the Seagull-Sag and Gunflint Trail residents were others from Grand Marais, Lutsen-Tofte and even as far away as the Twin Cities. Nancy Seaton, Chairperson of the Gunflint Trail Scenic Byways Committee (218-388-2275), who coordinated the weekend’s Peoples Planting sessions called this first effort, a good start. Local people of the area intend to continue planting trees on their land. However, the fire burnt-over tens-of-thousands of acres owned by the U.S. Forest Service and the State of Minnesota DNR. The big question that is now being asked is what are these public agencies going to do about the blackened lands under their jurisdiction. People are hoping that these agencies do more then spent years writing yet another encyclopedia of fine unrealizable good intentions. Precisely at 8:00 a.m. yesterday, with eighty or more Gunflint and Grand Marais residents looking on, Leanne Adams, president of the Seagull-Sag Home Owners Association cut the ribbon officially re-opening the last remain section of the Gunflint Trail. Cheers went up as the first six cars and trucks trailering boats and filled with tourist "going fishing" passed through the now opened roadblock. 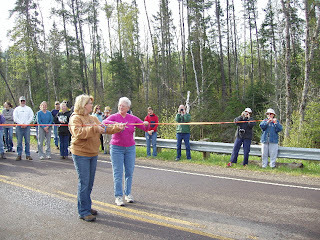 Ceremonial Ribbon Cutting, May 22, 8 a.m.
Gunflint Trail, MN — The last seven miles of the Gunflint Trail will be officially open as of 8:00 a.m. on Tuesday, May 22 permitting unrestricted access to the entire 57-miles of paved road between Grand Marais and the end of the Trail. To commemorate this event, a ribbon-cutting and tree-planting ceremony will take place at the Cross River bridge. The public is invited to attend this event. The recent Ham Lake Fire started in this area and the residents and businesses along this seven-mile stretch were not only the first to be evacuated, but are also the last to return home. The evacuation order issued on May 6th forced business owners and residents to temporarily relocate while up to 1,000 firefighters based their operations in this area. Thanks to their efforts, the Ham Lake Fire is now contained, crews and equipments have left the area, and residents are now free to go home and get back to business. Coinciding with the re-opening of the area at the end of the Gunflint Trail, all but two entry points into the Boundary Waters Canoe Area Wilderness (BWCAW) will be re-opened and permits can once again be issued for wilderness canoe trips. With the fire expected to be fully contained shortly, the last of the evacuees from the lakes at the end of the Gunflint Trail can finally return home. According to the Sheriff Mark Falk, property owners from Round Lake to the end of the Gunflint will be allowed access in and out of the evacuation area. Falk went on to state that, "This privilege is being extended to property owners only." This new order went into effect yesterday. The Sheriff also announced that the evacuation order for the end of the Gunflint Trail will be fully lifted at 8:00 am on Tuesday, May 22. At this time the last remaining roadblock on the Gunflint Trail will be removed and the entire Trail will be open once again for travel by everyone. While the loses suffered by many Gunflint residents is certainly tragic and morned by our community, we will recover! Meanwhile, somethings are even returning to normal again - it snowed last night! Gunflint residents awoke to a dusting of snow this morning. Certainly a normal May occurrence on the Trail. Update: 2007-05-16 10:06:36 PM CDT: The Ham Lake Fire, located 49 miles NW of Grand Marais, MN on the Gunflint Trail has been burning since May 5. To date, 74,814 acres have burned: 36,443 acres are in the United States; 38,371 acres are in Canada. Containment is now estimated at 20% for the entire fire; U.S. estimated at 50%. American aerial and ground resources are being utilized in a unified effort with Canadian forces. The American operation is being managed by Paul Broyles' Type 1 National Incident Management Team (IMT). A Canadian Type 1 IMT is at Sandstone Lake in Ontario. Sunday night's rainfall and higher humidities allowed forces to significant gains in the fire suppression effort on the American part of the Ham Lake Fire. There was also no significant growth in the fire perimeter on the U.S. side. The south, the southwest, and the west flanks of the fire continue to hold. Significant direct-line progress was completed on the south flank of the fire finger from the Iron Lake area to Gunflint Lake. The west side of this flank did move some to the west toward Bedew Lake; however crews were able to get containment lines around the bulge. Crews worked spots and installed hose lays on Three-Mile Island in Sea Gull Lake. The northern flank in Canada has grown significantly in size yesterday, increasing by almost 13,000 acres. Canadian forces continued to focus on three geographic areas: 1) east flank, where a burnout is tentatively planned for today from south of Beulah Lake toward Little Gunflint Lake; 2) structural protection in the Saganaga Lake area; and 3) securing the north end of the fire between Saganaga Lake and Spoon Lake. Structural loss and other assessments continue on both sides of the U.S./Canada border. One hundred, thirty-three (133) total structures valued at $3.7 million were lost in the first few days of the incident in the U.S. Sixty-one were residences, 17 were commercial, and 55 were outbuilding and other structures. An estimated 200 residences and over 20 commercial operations remain threatened. There have been 14 structures confirmed lost in Canada. Effective at 12:00 PM on 5/16/07, the Mandatory/Imminent Evacuation area between the Voyageur Point (County Road 85) and the Cross River is being lifted. Areas now accessible include the Loon Lake and Gunflint Lake areas. The Gunflint Trail, and all roadways off of such, to the north of the Cross River are still under mandatory/imminent evacuation status due to the Ham Lake Fire. The rain the past two days that fell on the Gunflint has reduced the fire threat greatly. District Forest Ranger Mark stated at last night's briefing that on the US side of the Border the fire is "likely to be completely contained by Sunday." Also there is good news for the evacuees- residents from beyond Poplar Lake to the north side of Gunflint and Magnetic Lake will be allowed to return to their home today at noon. However, for residents on Seagull and Sag the blockade will remain in effect but they will be allow in to view their property but they are not suppose to stay. On the Canadian side the news in not so bright as the fire continues to burn. Many of the islands on Sag around Red Pine Island have been burnt. One structure, to date, was reported destroyed on these islands. Poplar Lake Area- One half inch of rain fell yesterday morning and damping rain fell again this morning which should at least help to cool down the fire a bit. The fire has now consumed some 134 structures and burnt-over 74,814 acres in the US and Canada as of yesterday. The Poplar Lake-Little Ollie residents and businesses that were evacuated on Thursday (May 10) were able to return on Saturday. However the evacuation remains in effect for all beyond Voyageurs Point on the west end of Poplar Lake. Trail Center store is open but the restaurant is closed to the public but serving fire fighters. Current Status American aerial and ground resources are being utilized in a unified effort with Canadian counterparts. The American operation is being managed by Paul Broyles' Type 1 National Incident Management Team (IMT). The Canadian Type 1 IMT is now in place at Sandstone Lake in Ontario.Good progress was made on the Ham Lake Fire today; there was no significant growth in the fire perimeter. The south, the southwest, and the west flanks of the fire continue to hold. Significant direct-line progress was completed on the south flank of the fire finger from the Iron Lake area to Gunflint Lake. The west side of this flank did move some to the west toward Bedew Lake; however crews were able to get containment lines around the bulge. The burnout that was planned for the northern part of the east flank of the finger west of Susana Lake yesterday was canceled; direct attack tactics were utilized. Also, spots on Three-Mile Island are being worked; and plumbing lines installed. In addition, the first island north of Red Pine Island has fire now.Canadian forces continue to focus on three geographic areas: 1) east flank, where a burnout is tentatively planned for today from south of Beulah Lake toward Little Gunflint Lake; 2) structural protection in the Saganaga Lake area; and 3) securing the north end of the fire between Saganaga Lake and Spoon Lake. The Canadian IMT evacuated seven Americans from the Canadian side of the border on Saganaga Lake (Red Pine Island). There have been 14 structures confirmed lost Thursday on the north side of Gunflint Lake and one on Red Pine Island in Canada.One hundred, thirty-three (133) total structures were lost in the first few days of the incident in the U.S. Sixty-one were residences, 17 were commercial, and 55 were outbuilding and other structures. Their estimated value remains at $3.7 million. An estimated 200 residences and over 20 commercial operations remain threatened.Also, the power company is working on restoring power to the main lines.Estimated Acreage/ containmentAcres burned: 74,814 acres. 36,443 acres are in the United States; 38,371 acres are in Canada. Containment is now estimated at 20% for the entire fire. U.S. portion of the fire is estimated at 50%. Projected containment date: May 20, 2007Resources on the Fire/CostsCrews: 32 (6 Canadian) Helicopters: 13 (7 Canadian) Engines: 66 Water tenders: 3 Dozers: 8 Available upon Demand: Medium Air Tankers 3 Heavy Air tankers - 2 Personnel: 1,091 (includes Canada) Costs: $5,975,656 Note: All figures as of 1700 hours May 14.CooperatorsCooperators include Gunflint Trail Volunteer Fire Department, Cook County, Minnesota Department of Natural Resources, American Red Cross, Forest Service, Bureau of Indian Affairs, Fish and Wildlife Service, National Weather Service, and Ontario Ministry of Natural Resources.Evacuations and Public MeetingsThe cautionary evacuation order for the area along the Gunflint Trail between Gunflint #1 (7401 Gunflint Trail) and Swamper Lake was lifted by the Cook County Sheriff yesterday morning. Also, the mandatory evacuation order for the area between Poplar Lake Fire Station and Voyageur Point (Cook County 85) was lifted. A mandatory evacuation order remains in effect for the west end Gunflint Trail (Cook County 85) and all roadways off of it to the north and west of Voyageur Point.Public informational meetings will be held today in Grand Marais, MN at the Arrowhead Center for the Arts, at 10:00 a.m. and 7:00 p.m. An informational meeting will also be held at the Poplar Lake Fire Station (Gunflint VFD #1) at 5:00 p.m. These meetings will continue on this schedule for the foreseeable future unless announced otherwise on WTIP Radio, the local Grand Marais FM station.Closures and restrictionsFor current information on closures for the Superior National Forest, including the BWCAW and Trails End Campground. Fire restrictions are in effect for Cook, Lake, and St. Louis counties. Under these restrictions the following are prohibited: recreational fires (except gas and propane fired camp stoves and grills), welding, acetylene torches, or other devices with open flames.Incident plans for tomorrowTomorrow, suppression resources will continue to utilize direct suppression tactics, further secure and hold containment lines, provide continued structural protection, particularly in the Gunflint and Loon lakes areas, and begin mop-up operations. Crews will also continue line construction from Gunflint Trail north past the east end of Mayhew Lake to Topper Lake to the Canadian border on the east side of the fire in coordination with the Canadian IMT. In addition, crews will continue to construct direct line south from the Gunflint trail to the south of Rush Lake. Fire suppression actions will continue on the north end of the fire near Saganaga Lake. Two strike teams (5 engines each) and several dozers are scheduled for release tomorrow.Fire weatherLate yesterday evening, light rain (0.1") fell on the fire in the Seagull Guard Station area. Gunflint Lodge received 0.09"; 0.5" fell at Trail Center. Unfortunately, some lightning also accompanied the showers. Fire suppression forces will be monitoring strike areas from the air and ground. A front will pass through later today, ushering in a drier and cooler air mass. Northwest winds will follow the front into Tuesday. Winds will be 8-14 mph. Temperatures will be in the high 50s; humidity will be in the low 40s.Fire and Other InformationA Joint Information Center (JIC) is open in Grand Marais, MN at the Court House in the Commissioner's Office (218-387-3401). The Cook County Sheriff has established a homeowner hot line for landowners in the evacuated area. The number is 218-387-3093. Please note the new Ham Lake Fire Information Center number is 801-413-0589. Fire Websites: <http://www.inciweb.org/ is the primary location for information on the Ham Lake Fire. Additional fire information can be found at mnics.org. and hamlakefire.com. The Ham Lake Fire continue to burn and another "Red Flag Warning day" is approaching. If the winds pick-up, as expected, the fire will likely continue to grow. While it difficult to get exact numbers of structures lost, a local resident who flew over the area yesterday estimates the number of building burnt as "approaching or maybe exceeding sixty." Wilderness Canoe Base along on Seagull Lake report that as many as thirty-seven of their sixty or so buildings have been destroyed. The camps sprinkler systems were not completely functional. Yesterday a "back burn" was undertaken by the Magnetic Rock Road to provide a fire break should the fire move towards Gunflint and Magnetic Lakes. As a preventive measure the North Gunflint Road was evacuated. According to USFS officials The this controlled burn is proceeding as planned. resources to be pushed to their limits tomorrow. It now appears that the Ham Lake Fire has destroyed as many as forty structures around Seagull and the Sag Lakes area. Read addition fire stories in the Duluth Tribune including an article on the two of us that escaped by boat. The Ham Lake fire continued to actively burn throughout the day expanding it's perimeter on the north, east and west. Cooler temperatures and moderate winds have slowed it somewhat today. The Cook County Sheriff has established a homeowner hot line for landowners in the evacuated area. This was operational at 3:00 PM today. The number is 218-387-3093. Landowners that properly identify themselves will be given status on their property. Communications and power lines north of the Seagull Guard station are destroyed. This is still a dangerous fire, multiple trees and hazards are across the Gunflint Trail and no one will be allowed from the Cross River Crossing to the end of the Trail. Briefings for the public will occur at 11 am at Gunflint Fire Department station #2 next to Gunflint Lodge and at 6pm at the Cook County Court House in Grand Marais. Currently 200+ people are on the fire. Seven Fire Departments from Cook County are assisting with structural protection. Forty structures have been lost and at least 90 more are threatened. One commercial building was lost with several others damaged. Combined value of threatened property is $38,000,000. A Type 1 Team from the Great Basin has been ordered and will begin arriving today. They are individuals from Utah, Nevada and southern Idaho. The Incident Command Post has been moved to Gunflint Lodge Conference Center. Today's temperatures were in the 60's with RH 68% and winds WSW at 14 MPH with gusts up to 20 MPH. The Gunflint Trail did not receive any precipitation over night or this morning. Conditions for extreme fire behavior are still in effect. More stringent burning restrictions have been put in place by the MN Department of Natural Resources and the Superior National Forest to cover Cook, Lake and portions of St. Louis County north of County Rd 16 beginning at 8:00 AM on Monday, May 7. Under these more elevated restrictions the following are prohibited: No burning permits will be issued except for special exceptions issued by State or Federal agencies having suppression responsibilities. Camp fires are not allowed. No charcoal permitted. Gas and propane fired camp stoves, grills or similar devices are allowed. No welding, acetylene torches or other devices with open flame allowed in forested areas except under special permits. Use of fireworks and explosives in municipalities will be under control of municipalities. Smoking outdoors is permitted. PLEASE USE CAUTION! Reminder to visitors arriving for the 2007 Fishing Opener: The Gunflint Trail above the Cross River bridge is closed. See restrictions above. Yesterday Jim Raml and I worked on protecting the houses at the end of the Seagull Lake Road. We activated the sprinkler systems on the three home where we were working and started laying out garden hoses to protect Raml's house. At 10:40am three trucks of USFS/DNR fire fighters of about 5-6 people arrived to assist. They informed us the fire was headed our way. Fire hose lines where laid out and another pump was started to hose down where the sprinklers were not reaching. At approximately 12:30 another DNR firefighter arrived and informed us we had about 2 1/2 hours until the fire arrived. About 15 minutes latter it started getting very warm around Raml's buildings where we were working at the time and suddenly fire appeared over the hill about fifty feet behind Raml's house. Jim ran to his house to get his cat and I was going to assist him. As I headed for the house I noted that the last firefighter that was assisting us was speeding off down the road. Even though they were order to evacuate no one even bother in inform Jim o r I. We evacuated by boat, heading west down Seagull lake we spent then next 4-5 hours on a campsite on Three Miles island watching the fire at the east end of Seagull burn. Finally we decided to return. As we traveled we could see that must of the south shore of Seagull that had not been burnt in previous fires was now gone- Meditation Lake was gone. And it appeared the fire was now traveling down through though Blankenburgs Landing. We were able to reach Raml's house and to our surprise his and the two other houses where we had activated the sprinklers were still standing although the fire had burnt all around and over them. The sprinklers were still running, but the USFS pump had stopped and we could not get it going again. Spot fires were still burning around the structures. I headed out along the Seagull Road at about 6:30PM to see if I could round-up another fire pump- had to cut through several burning trees to reach the Gunflint. Shortly after getting to the Gunflint the north end of the fire front burnt across the road I had just traveled, closing it off. Upon making contact with USFS firefighters I was informed that no pumps were available and the return road was on fire anyways. Jim was finally able to get through the Seagull Road with his truck about another hour latter after the fire had passed through. 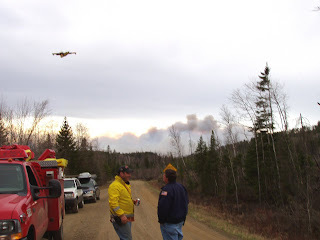 From what I could see and heard from others on the fire several buildings had been burnt along the Seagull Road, which did not have sprinklers, and more buildings were gone on the Gunflint by the road. Firefighters were attempting to save the buildings at Seagull fishing camp as the fire passed through towards Seagull outfitters. On the northern flank of the fire, the fire had now jumped Seagull lake and Fishhook Island was on fire. Strong wind continue to blow the fire northwards. From what I could see it did not look good for the remaining structures on the end of the Gunflint. However there is a bit of good news- Ron appears to be safe: one of the USFS firefighters saw him hitch-hike down the Gunflint towards town. And as of yet there appears to have been no injurers. THIS EVENING. THE FIRE WEATHER WATCH IS NO LONGER IN EFFECT. FIRE DANGER ACROSS THAT AREA TODAY. Note- Strong SE winds could push the long fire front paralleling the Gunflint Trail into the populated Gunflint and Magnetic Lakes area north of the Gunflint Trail. The Ham Lake fire was first reported to the Cook County Sheriff at approximately 11:30 this morning. Tuscarora Lodge has been evacuated and two water bombers were dropping water around the perimeter of the Lodge. One out building has been lost and several other buildings are threatened at the lodge. Strong northeasterly winds were fanning the fire. As of 2:30 this afternoon the fire had crossed Mine Lake, a distance of about three miles. While the cause of the fire is as yet undetermined several Gunflint District foresters confirmed that the fire appears to have started on a campsite on the northwest end of Ham Lake. There was no campfire ban in place when the fire was spotted. Conditions in the forest are extremely dry and the "green-up" is just getting underway. For many years Ron (last name unknown) has lived during the summer in a tent camp located near Mine Lake. While he spends his winter in Minneapolis, Ron normally returns to the Gunflint at about the time ice goes out in the spring. He has been seen this spring hitch-hiking up the Gunflint to his campsite. According to a USFS spokesperson, as of late this afternoon Ron's whereabouts are unknown and plan to search for him has been drawn-up. The fire is currently being managed by the Gunflint Ranger District-USFS. A type II fire team has been activated, and will be arriving this evening to take charge. The Gunflint Trail Volunteer Fire Department is on the scene also.